The Bridgette Boylan Interiors Design Studio encompasses over three thousand square feet of resources for the home. Throughout our office are various vignettes featuring everything from paint finishes, tiles, floorcoverings, cabinets, granite and quartz tops to decorative cabinet hardware, all reflecting the latest trends in materials and products. We have two design centers geared towards both new construction and renovation projects. These centers consist of many exterior material samples as well as all necessary interior finish products. Our facilities enable us to meet with clients to select all exterior and interior finishes for new construction and renovation projects in one location, saving our clients valuable time and money. Our design resource room contains hundreds of fabric, trim, and wallpaper samples from a variety of creative vendors. In addition, our furniture library and rug room provide catalogs and samples from quality manufacturers in the latest styles for all your furnishing needs. "We have been working with Bridgette Boylan Interiors on numerous projects in the past couple years. They have a team of extremely talented and creative people who provide great service. Bridgette Boylan is a very talented and professional designer. She goes above and beyond to create unique environments for her clients to make sure they are pleased. She always has a positive attitude and maintains the highest standard. Bridgette Boylan Interiors is always a pleasure to work with and we would recommend them to anyone." "How can I praise Bridgette Boylan Interiors enough? 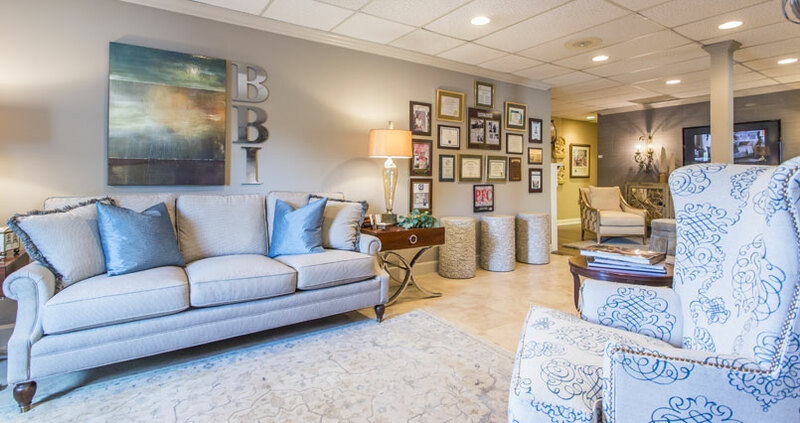 Bridgette and all of her staff always put the needs of the client first. Whether the job is large or small, professionalism, efficiency, and quality guide the client experience . I rely on BBI for more than you can imagine. I am never disappointed and am ever grateful." "We at Frost Builders have done business with Bridgette Boylan Interiors for more than 15 years and could not be more pleased. From working directly with one of our customers to working with us on a speculative home, Bridgette and her company bring a wonderful sense of style and professionalism that we as a business value. They have the ability to work with people and any variety of style to make sure the project flows seamlessly. With an up to date show room and a wide variety of samples, Bridgette Boylan Interiors make our job easier as a contractor. " David Frost / Frost Builders Inc.